I usually save my fun for socks. Photo courtesy of Becki Wickert. 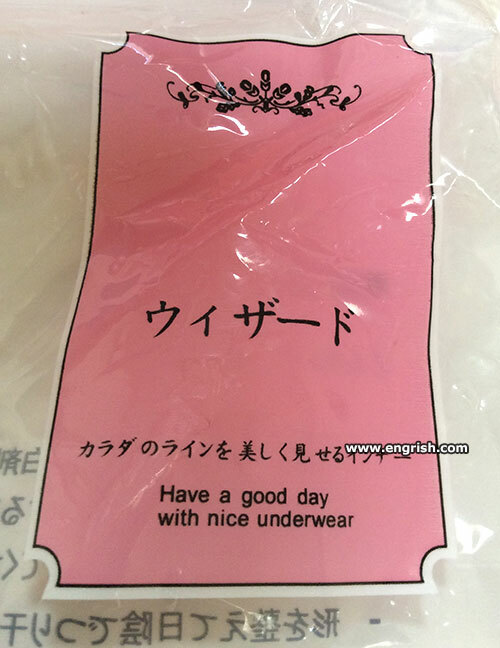 Have a GREAT day with NO underwear! …even if it’s someone else’s. Make Underwear Great Again ! Have a nice skidmark free day! Usually I wait until everyone’s jumped in with a post before I translate. But in this case, an early translation just might add to the Engrish fun. This (??) beautifully shows the lines of your body. The “www.engrish.com” blocks the rest of the sentence, hence the “??”. Have fun with THAT one, word wizards! Nothing—so improves underwear, as its consensual removal. Nice underwear. Like all good packaging. Is designed to improve your appetite, for the contents within. …shame if something were to happen to it…. Wait. Days can wear underwear? Happiness is wearing underwear that does not irritate you. That’s why we have tagless underwear nowadays. but there’s a party in my socks! @Coffeebot 0913. Good. Invite your pants down to join it. Mother says: Don’t go out with holes in your underwear, in case you have an accident. Billy Connolly says: If I were to have an accident, the holes in my underwear would be the last thing you have to worry about. @Classic Steve | 8:29 am: It protects their weak ends. @Pete & Algernon: If my body were doing lines, I wouldn’t want my underwear to show it! If the old bod has lots of lines, it may need ironing before use. @Pete: If wizard = warlock, maybe it’s a part of the Underpants Gnomes’ plan. He casually says, “Yes, Madam”, and removes the dress. Then she says, “Jeeves, take off my underwear”. Again, he says, “Yes, Madam” and removes the undergarment. She then says, “Jeeves, take off my bra”. Again, with no hesitation he says, “Yes, Madam” and removes the bra.